The discredited self-proclaimed inventor of Bitcoin, Australian business man Craig Wright, is back to mess with the cryptocurrencies world. A firm controlled by Wright is filling a huge number of patents for various applications of blockchain technology estimated to be worth over a billion dollar, according to the Reuters news agency. The fact that the real inventor of Bitcoin left his breakthrough invention in the public domain allowed for rapid development of new derivative projects, first in new cryptocurrencies and these days especially around blockchain solutions for banks and other financial institutions. If Wright will be allowed to gain legal control of the technology all that might change. While trying to keep the connection to Wright hidden, his firm (Antigua-registered EITC Holdings Ltd) has reportedly already filled applications for over fifty patents in the UK since February, with up to four-hundredths planned. In May Wright made an announcement that he is the creator of Bitcoin with much fanfare, appearing simultaneously on Forbes and the Economist as well as an interview on the BBC. 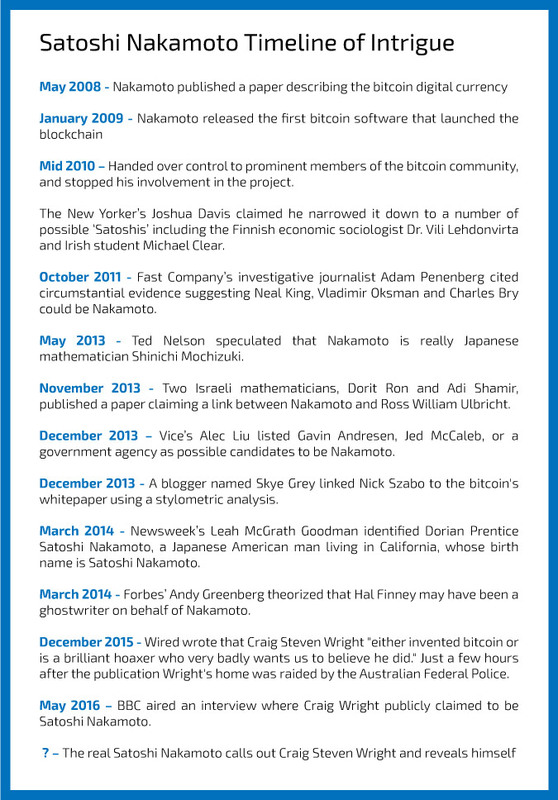 Giving validity to the claim were Bitcoin experts and leading community members, Gavin Andresen and Jon Matonis, who seemed to confirm at the time that the Australian businessman is indeed Satoshi Nakamoto. However, many refused to accept Wright as the creator of Bitcoin and challenged him to provide proof by making a transfer from Satoshi’s wallet or just sign a verified a message using the private key from block #1. Wright very quickly decided to disappear, he deleted his blog and claimed he will not talk to the public ever again. The last meaningful message from him was that he is sorry for hurting reputation of Andresen and Matonis. While trying to keep the connection to Wright hidden, his firm (Antigua-registered EITC Holdings Ltd) has reportedly already filled applications for over fifty patents in the UK since February, with up to four-hundredths planned. Remember Wright? However, many refused to accept Wright as the creator of Bitcoin and challenged him to provide proof by making a transfer from Satoshi’s wallet or just sign a verified a message using the private key from block #1. Wright very quickly decided to disappear, he deleted his blog and claimed he will not talk to the public ever again. The last meaningful message from him was that he is sorry for hurting reputation of Andresen and Matonis .